There was a spectacular lightning display over Granada, Nicaragua last night. 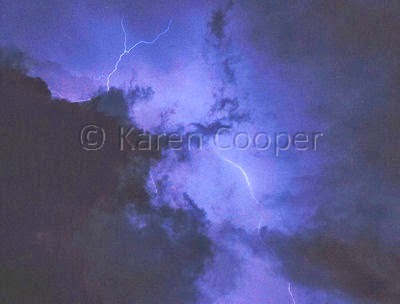 One of my favorite challenges is to capture lightning on images. I was lucky enough last year to catch a shot over Antigua, Guatemala and have been hooked on it ever since. There are some areas in the world that have more lightning than others. The place with the most lightning is in the Congo. Lightning can even be triggered by other things than the weather, volcanoes and rockets for instance. There is even a phenomena called "St. Elmo's Fire" that has been reported. Also known as "ball lightning", St. Elmo's Fire has been rarely photographed. One of those being in the right place at the right time with the right equipment things. Though I certainly don't consider myself a storm chaser, I am hooked on getting more shots of this spectacular natural display by good ol' Mother Nature. And being safe and dry inside is a bonus as well. I hear a chicken clucking somewhere! that storm looks amazing. thanks for sharing! hope you get some more great shots!